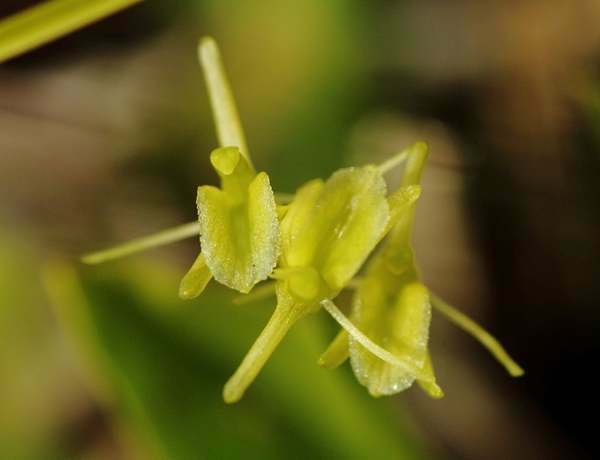 The Fen orchid is very small and inconspicuous, and is now listed as an endangered species in Britain where it occurs in permanently wet marshland on the Norfolk Broads, with a further colony to be found in dune slacks in South Wales. The plants in South Wales are referred to by some as Liparis loeselii var. ovata because of slight morphological differences (the leaves are broader, more oval and slightly hooded at the tip) although genetic studies have revealed little or no difference between them. This orchid occurs throughout the temperate zone of Europe and also in temperate and boreal North America. Altough sand dunes and permanently wet marshland would appear to be very different habitats they both offer the two basic requirements of the Fen Orchid; short sward grassland and very wet (for at least part of the year) ground containing high levels of calcium. Fens differ from bogs because they are fed by water which has high levels of alkalinity (bogs are acidic), and in the case of Wales, the soil in the sand dune slacks is comprised largely of crushed shell particles and are submerged in water during the winter. By far the larger part of the British population is to be found in the dune slacks of South Wales at Kenfig National Nature Reserve where up to 90% of the total UK number can be found. 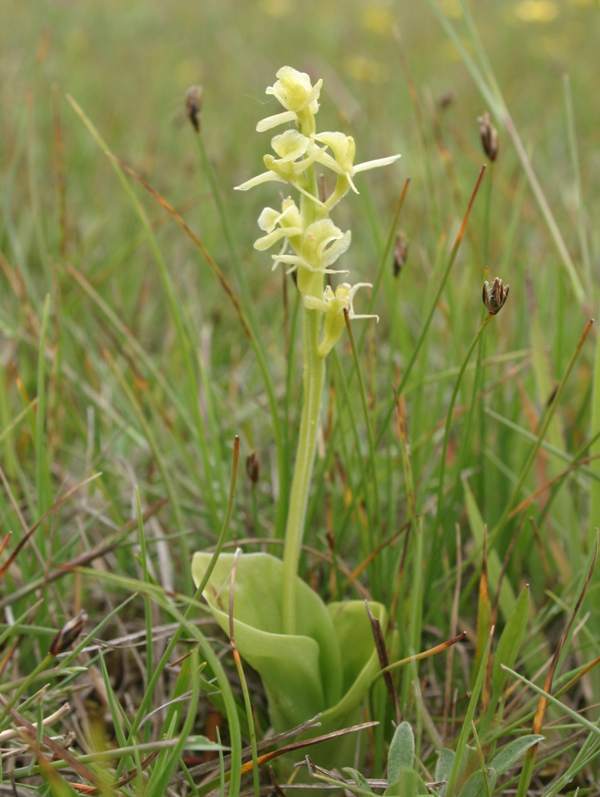 Originally found in a number of coastal sand dune sites along the South Wales coast, the Fen Orchid is now extinct in all of them except Kenfig. 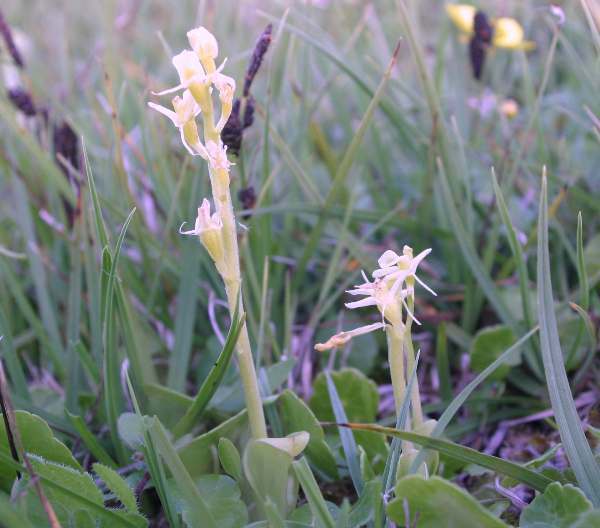 The threat to the Fen Orchid population at Kenfig National Nature Reserve was identified during the 1990s, and it is hoped that colonisation of the new dune slacks by the fen orchid will take place within 10 years of the start of the programme. The scheme is to be monitored throughout by CCW. Meanwhile, at Cambridge University Botanic Garden there is an ongoing programme to try and harvest the mycorrhizal fungus whose presence in the soil is essential for the germination and growth of Fen Orchid seeds. Once this fungus has been captured it will enable the team to grow Fen Orchids from seed and study their ecology in greater depth. If successful the project could enable them to grow Fen Orchids in protected areas for subsequent reintroduction to the wild. Like the Common Twayblade (Neottia ovata) to which the Fen orchid is related it is hard to spot as it blends in so well with the other plants to be found in the same area. It seldom grows taller than 25 cm, normally has two broad leaves (again like the Twayblade) and typically three to six distinctive greenish-yellow flowers. This tiny orchid comes into flower in early June and can persist until the beginning of July.